The Islamic Society of North America (ISNA) is pleased to announce the launch of a compendium of resources on mental health and gun violence, developed by the Interfaith Disability Advocacy Coalition (IDAC). ISNA representative Maggie Siddiqi served as one of IDAC’s writers for the report. 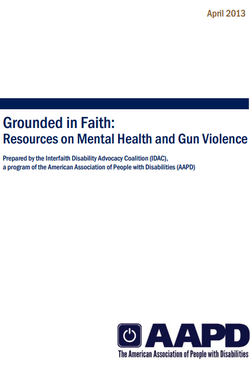 The compendium, entitled, Grounded in Faith: Resources on Mental Health and Gun Violence is available online by clicking here. It is designed as a resource for congregational leaders, disability advocates, and other concerned persons who wish to ensure that the on-going debate around gun violence prevention does not stigmatize people with mental illnesses, and deprive them of their rights and freedoms. IDAC is a program of the AAPD and ISNA is serves as a member of IDAC’s Steering Committee. Its mission is to work to mobilize the religious community to take action on disability policy issues with Congress, the President and Administration, and society at large. IDAC is a diverse, nonpartisan advocacy coalition of 32 national religious organizations, including representatives from the Christian, Jewish, Muslim, Hindu, and Sikh traditions, whose core spiritual values affirm the rights and dignity of people with disabilities.